Trends reflect nature, favorite places and things. They incorporate graphic design, motifs, and custom monograms. They lovingly embrace color, style and texture. The bottom line today is that invitations are only limited by one’s imagination. If you aren't creative, seek a professional stationer to assist you. Letterpress has gained new popularity among brides today. It is synonymous with style, luxury and sophistication. This centuries-old relief printing method has transformed today’s stationery into a new generation of eco-chic. The paper is rich with characteristic texture; soft to the touch but heavy in weight. At Paper Dance, we love taking originality one step further with our clients by incorporating hand-painted edges in one of the bride’s wedding colors. 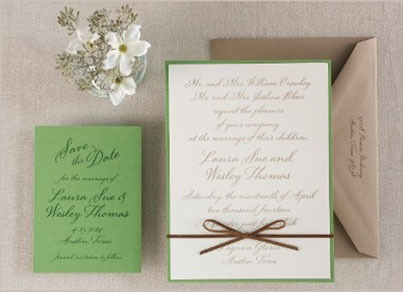 This is a trend that we see not only in wedding stationery, but social stationery as well. Trends range from minimalistic to country chic; romantic garden to vintage; letterpress to lasercut; formal to whimsy; retro to modern; cityscape to circus; deco to decadent; geometric to 3D. Note that “the pleasure of your company” replaces “the honour of your presence” when the ceremony is held at a home, club, or hotel and not on sacred ground. A noon wedding is worded “at twelve o’clock.” Weddings on the half hour are written as "half after" the hour instead of "half past" the hour. A house or apartment number is written out through the number ten. Afternoon begins at twelve o’clock. Evening begins at six o’clock. Nicknames are never used on traditional wedding invitations. Abbreviations are not used except for Mr. and Mrs. The words "junior" and "senior" are written in lower case. Envelopes should be hand-addressed. Do not use labels. A separate reception card is not required when the ceremony and reception are at the same location.